Rewriting Russian History: Did Boris Yeltsin Steal the 1996 Presidential Election? A year ago, the tomes of Russia's official history got a little fatter thanks to President Dmitri Medvedev, who helped publish the letters of post-Soviet Russia's first President, Boris Yeltsin. In a foreword to the collection, Medvedev eulogized the founding father, who died in 2007, for creating "the base of a new Russian statehood, without which none of our future successes would be possible." But behind closed doors on Monday, during a meeting with opposition leaders, Medvedev reportedly offered another take on the official story. According to four people who were in the room, Medvedev stated, like a bolt from the blue, that Russia's first President did not actually win re-election in 1996 for his second term. The second presidential vote in Russia's history, in other words, was rigged. With less than two weeks before Russia's next presidential election, this is not a random piece of trivia for the country's chattering class. 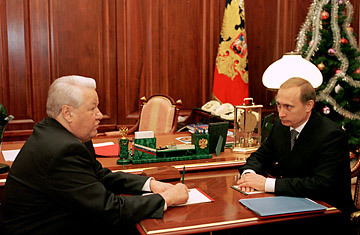 It was Yeltsin, after all, who named Vladimir Putin as his chosen successor in 2000 to ease him into power. And it was Putin who did the same favor for Medvedev eight years later. So if the third link in this chain has admitted that the first link was a fraud, what does that make him? What does that make the entire system? What does that mean for Putin's campaign to win a third term as President? When TIME reached the Kremlin for comment on Thursday, a source said he was not sure if Medvedev had said this or not. "The Kremlin obviously has an official position on the results of the  elections: Yeltsin won," the Kremlin source said on condition of anonymity. "As for rumors to the contrary, the Kremlin has no official position." Indeed, neither Medvedev nor his press office have made any statement on the matter, which has not helped make the questions go away. "If Yeltsin was not a legal President, how legal were his successors? How legal is Putin?" asked Boris Nemtsov, an opposition leader who attended the meeting with Medvedev. In an interview with TIME on Thursday, he said that Medvedev, while debating electoral laws with the activists, "took a pause and said, 'We all know that Boris Nikolaevich Yeltsin did not win in 1996.'" Three other opposition figures who were at that meeting have separately confirmed in radio and television interviews that Medvedev said this. According to their statements, the conversation went like this. After sitting down with the opposition activists, Medvedev was bombarded with complaints about a parliamentary election held in December. That vote, they told him, had been blatantly rigged by the United Russia party, which is led by Medvedev and Putin. The results must be scrapped, the oppositionists insisted, and a new election must take place to save the legitimacy of the State Duma, Russia's lower house of parliament. Based on ample evidence of vote rigging, Russia's opposition leaders have been making this demand for months now, and tens of thousands of Russians have rallied in the streets of Moscow to support them in calling for a parliamentary revote. The phrase that Medvedev uttered in response "will go down in history," said Sergei Babkin, the leader of an opposition party, who was the first to reveal the details of the closed-door meeting during a radio interview the following day. "He brought up the presidential elections of 1996 and said, 'There is hardly any doubt who won [that race]. It was not Boris Nikolaevich Yeltsin." There has indeed been lots of speculation that dirty tricks were used that year to push Yeltsin past the post. The powerful oligarchs in Yeltsin's circle have said on the record before that their goal was to get Yeltsin a second term by any means necessary. By 1996, Russia's transition to capitalism had impoverished millions of people. The economic reforms known as "shock therapy" had caused hyperinflation, and Yeltsin had gotten himself entangled in a highly unpopular war with the separatist region of Chechnya. Meanwhile, the Communist Party candidate, Gennadi Zyuganov, was promising the people a return to the stability of the U.S.S.R. In the first round of voting, the two were neck and neck, with Yeltsin getting 35% against 32% for Zyuganov. Yeltsin narrowly won in a runoff vote with 53.8%. So if anyone should be up in arms about Medvedev's alleged revelation, it should probably be Zyuganov. But the communist, who is currently running against Putin for the presidency, made no mention of the issue during a rambling campaign speech on Thursday. The only leader of his party to comment on the matter did not seem too upset about news and placed the burden of proof back on Medvedev. "Show us the documentation," Sergei Obukhov, a member of the party's central committee, told the news agency Novy Region. "We have no such information." That is perhaps the most amazing thing about this purported scandal. Three days after it broke, it has practically disappeared from the headlines and never even made a blip on the state-run TV news. Even the opposition leaders who claim to have heard the historic slip seem sort of blasé about it. In Babkin's words, after Medvedev said that the 1996 election was rigged: "It was not discussed any further. It passed without comment." The only chord of outrage has issued from the man who headed Yeltsin's re-election campaign that year, Anatoly Chubais, but it was outrage of a peculiar sort. "Were there violations in the campaign of 1996? Of course, there were," he wrote in his blog on Thursday. But they were not enough to change the final results, Chubais wrote. And besides, "When those who side with the ruling authorities say, 'Yes, our elections were fixed, but no more than usual,' they are putting themselves in a funny position." If the 1996 vote is dismissed as a fraud, he added, "then we automatically have to deem both of President Putin's terms illegitimate along with the presidency of Medvedev." In conclusion, Chubais suggested that everybody stop claiming that Yeltsin lost in 1996, because it just makes everyone look bad. And that will likely be the outcome of Medvedev's meeting: a return to the authorized version of the past. There will certainly be no reversal of history. The stakes are simply too high, and to borrow Medvedev's phrase from his introduction to Yeltsin's collection of letters, "none of our future successes would be possible" without the system that Yeltsin built. So for now, the system is focusing on its next round of success. On March 4, Putin will be the odds-on favorite to win a third presidential term. The closest challenger, just like in 1996, is the Communist Party's Zyuganov, who will likely see a little bit of history repeating.